Japanese children who were attentive enough to tune into the Yomiuri TV Network at 7:30 pm, Sunday, October 6th, couldn’t possibly know they were witnessing an historic moment. By all accounts, it was a quiet beginning. Much flashier and better-known cartoons were to be found on other networks. Japan’s Fuji Television was the clear leader at the time, with such colorful, action-filled programs as Scientific Ninja Team Gatchaman (which has since gone by other names, including Battle of the Planets), another superhero series called Casshan, a trio of “super robot” programs called Zero Tester, Getta Robo, and (mightiest of all) Mazinger Z, and even a family-oriented anime based on the classic children’s story Heidi. 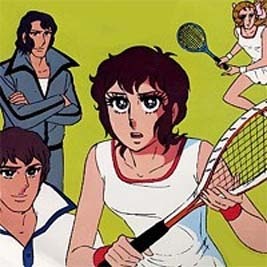 Other networks carried sports anime such as the tennis drama Aim for the Ace, action-adventure such as Hurricane Polymer, and even a uniquely risque show for older viewers called Cutey Honey. Yomiuri was no slouch in the anime department, having delivered genuine hits in previous years such as Lupin III, Star of the Giants (a baseball drama) and the talking cat Doraemon, one of the longest-running childrens’ anime of all time. But 1974 was a very lean year. 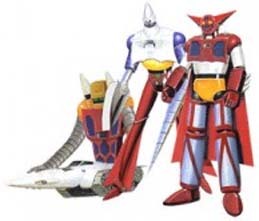 Yomiuri had only four anime programs to hold up against Fuji’s onslaught of powerhouses. Space Battleship Yamato was one of those four, and against such competition, it was found wanting. It also didn’t help that the series went directly up against Heidi of the Alps, which filled the same time slot on another network. She might have looked demure, but the scrappy little gal had gathered a ferociously loyal audience that Yamato could not easily lure away. Happily, we know that this inauspicious kickoff didn’t continue to be the case forever. But blockbuster status was almost three years away, and when the initial TV ratings came in at a mere 6%, no one on the Yamato staff thought the show was going to figure strongly in their future. They were sweating blood to get it on the air, sometimes meeting the weekly deadline by mere minutes, and it must have been incredibly demoralizing to continue at this pace under the belief that practically no one was watching. 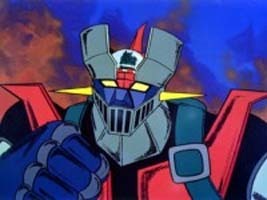 The TV series wasn’t the only product with the name Yamato on it. 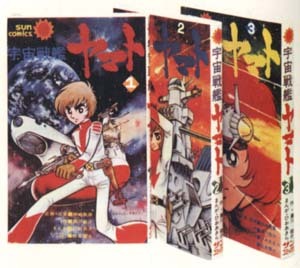 A 45 rpm single and two separate manga adaptations would also be presented to the public before the year ended, but the crew were working under such slavish conditions that they had no time at all to personally connect with their audience. Not even VCR’s could come to the rescue, still being too expensive for the average household. That cold, hard single-digit rating was their only response from the outside world. Today, of course, it couldn’t be more different. Audience reactions can often be found minutes after a program is broadcast, with no more energy expended than the click of a mouse. In a way, 1974 itself was Yamato‘s most formidable obstacle. If you’re old enough to remember the following facts about our own country, it won’t be hard for you to appreciate how far we’ve all come, both in Japan and the States. The 55 mph speed limit was imposed on our highways. Sonny & Cher split up. Hank Aaron broke Babe Ruth’s home run record. President Richard Nixon resigned and was pardoned by his successor, Gerald Ford. A new product called a “computer” was released, named the Altair 8800. Thanks to a major energy crisis caused by a Middle East oil embargo, the entire globe was caught in an economic recession. India became the world’s sixth nuclear power. “Lucy” the Australopithecus, was discovered in Africa. Dr. Henry Heimlich introduced a manuever meant to aid choking victims. America’s highest-rated prime-time TV shows were called Chico and the Man, the Jeffersons, and Good Times. Saturday morning cartoons included Land of the Lost, Hong Kong Phooey, The New Adventures of Gilligan, Partridge Family 2200 AD, Valley of theDinosaurs,and Wheelie and the Chopper Bunch. The first “word processors” appeared in offices across the country. A gallon of gas was 55 cents. A first-class postage stamp cost 10 cents. A new car averaged $3,756.00. A gallon of milk cost $1.56. In popular music, the hits were Band on the Run by Paul McCartney & Wings, I shot the Sheriff by Eric Clapton, The Loco-Motion by Grand Funk Railroad and Sunshine on my Shoulders by John Denver. Moviegoers were flocking to see The Godfather part II, Young Frankenstein, Blazing Saddles, The Towering Inferno, and Chinatown. And though few people knew about it at the time, children were born in 1974 named Seth Green, Alyson Hannigan, Leonardo DiCaprio, and Penelope Cruz. 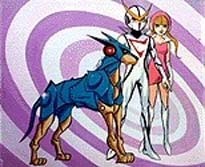 Getting back to the Japanese side of things, it’s interesting to note one very important fact: despite its appearance in the first few paragraphs of this story and its incredible usefulness in summing up an entire realm of entertainment, the word “anime” itself did not yet exist in when Yamato debuted in 1974. 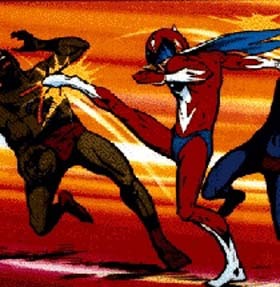 Instead, animated programs were referred to as “Terebi Manga,” which translated literally to “TV Comics.” Most animated programs at the time had originated from childrens’ manga publications, and thus were not generally viewed as a challenging medium. Yamato, by contrast, was wholly original. 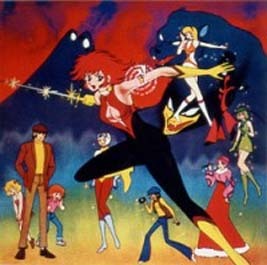 Its manga did not appear until after the TV series was underway. 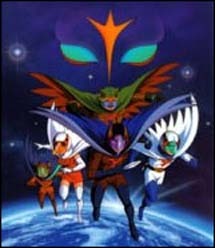 Ignoring for the moment all the other pivotal contributions Yamato made to the world of entertainment, it’s worth noting that this was the single program that raised the standard; the one which ultimately pushed the entire Japanese animation medium forward to the point where it warranted a more respectable (and accurate) name: Anime.